If this is solved elsewhere, please direct me. Thanks! Bob McGuigan: This isn't a quick question unless there is a reference to a detailed exposition elsewhere on SL. There must be at least a couple of dozen variations to consider. But here is one for your Black response at a. White has made life in the corner on a small scale, but the white stones to the right have been weakened. 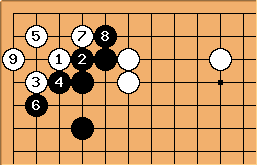 When Black plays the guzumi at , this is intended to make things difficult for White. White can live, as shown here, but on a small scale. If there is a Black stone toward the middle of the left side, then White's small life might not be enough. 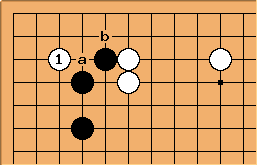 Often White will not respond immediately to but will wait and use the stone as aji for a bigger invasion of Black's left side formation. White lives, but the position is going to be cut up and destroyed. 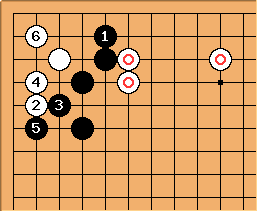 White can also use the aji of the threat of the 3-3 invasion to reduce black and build up a position on the left.